A Literary Odyssey: Gulliver's Travels Read-Along Part Three: A Voyage to Laputa, Balnibarbi, Luggnagg, Glubbdubdrib, and Japan. Gulliver's Travels Read-Along Part Three: A Voyage to Laputa, Balnibarbi, Luggnagg, Glubbdubdrib, and Japan. Two weeks ago the participants in my little read-along posted their thoughts on the first section of Gulliver's Travels by Jonathan Swift. We talked a lot about the land of the little people! Last week, we all posted on the second of Gulliver's travels, to the place of giants. It was great to see everyone's reactions and thoughts on this polar opposite place and experience. This week, we all read the third of four parts, Gulliver's travels to Laputa, Balnibarbi, Luggnagg, Glubbdubdrib, and Japan. That's quite a mouthful, isn't it? Gulliver is at it again. Once more, Gulliver takes to the sea in pursuit of adventure and misfortune strikes. In this case, his ship is not captured in a storm, but caught by pirates. Gulliver is cast off in a boat with limited food. Luckily for him, a floating island appears out of the sky and inhabitants rescue him. The Laputans are a race that are seemingly obsessed with mathematics and music. Most of them spend a great deal of time studying these subjects, but they aren't put to great use. Instead, their knowledge seems rather silly and isn't put to good use. Gulliver learns all kinds of information about the people and their beliefs, including their refusal to use right angles in anything they build. The Laputans also seem to be very strict with certain rules. My favorite chapter in the entire section is the third, where Gulliver discusses some of the rules and procedures of the island. When a city is in rebellion, it is common for the island to "hover" above and deprive the city below of sun and rain, forcing compliance. This is definitely an advanced idea, don't you think? What would kings and queens of England have given for that ability during the American Revolution? You also begin to understand the differences here between the societies that Gulliver has visited. If you look at the first two places he visited: Lilliput and Brobdingnag, the only really differences are due to size. There doesn't appear to be differences in regards to intelligence and advancements. Here, we get the first inkling of something completely different. Those on the floating island, and the "nobility" have more technology than their subjects. They also abuse their technology (like hovering the island over poor farmers), to gain advantages! There is also a huge difference between those who spend their life studying (the intellectuals) and those who do not (the commoners). It is certainly interesting to think of all of this in today's world and context. Our government certainly has more technology than the everyday person and there are intellectuals who are more concerned with learning than with spreading their knowledge for the well being of the people around them. After Laputa, Gulliver decides to leave and visits a few other places. Most notably is that of Glubbdubdrib, where Gulliver is allowed to speak to the ghosts of the dead. This section is probably one of my favorites, as Gulliver selects people to speak with. It made me wonder who I would choose to speak with if given the chance (I would probably ask for George Washington, Benjamin Franklin, Robert E. Lee, Teddy and Franklin Roosevelt, and Martin Luther King Jr. Wouldn't that be a lively bunch??). When Gulliver is finally allowed to go home, he of course finds himself in Japan (I am thinking Swift threw this in as the "Orient" was still quite exotic back then, and to make his satire more realistic). In all, this section seems to speak a lot more to human desire and want. Sometimes the very things we want are harmful to the society we live in. Gulliver discovers that for himself and criticizes the people he meets for carrying those harmful ideas out. Anyway, there is only one more section to go, and it is a doozy. Like the first and second sections, the third and fourth play off each other in a remarkable way and I am looking forward to reading everyone's final thoughts on Gulliver's Travels! If you have your post up, please comment here with a link so that I may put a link in on this post. Check back throughout the day to visit other bloggers to see their thoughts about dear old Gulliver and his travels to other places! Sorry for my delay! I was caused by some tech isues! Also, I am waiting for a new Thursday Treat! Thank you so much for giving us suach a great blog, I love it! 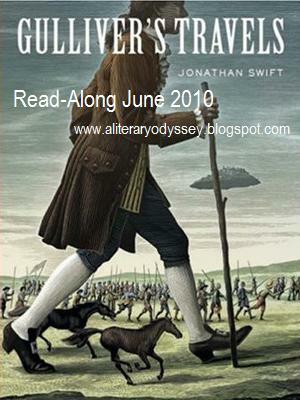 Here's my post: http://lindseysparks.blogspot.com/2010/06/gullivers-travels-part-three.html. I thought the mention of Japan was funny. It's all of this fantastical, made-up places, then bam! Japan. You're probably right that it sounded exotic but made everything seem more realistic. It makes me laugh though.